1 Place gammon snugly in saucepan, add peppercorns, bay leaf and onion. Just cover with water, put on lid and bring to boil. 2 Reduce to simmer and cook for 2 hours. Allow to cool in liquid. 3 Cut off skin, leaving on fat. Combine mustard and sugar and smear over fat. Dot with the cloves and bake at 200C/Gas 6 for 30-40 minutes, until caramelised. Serve with mustard. 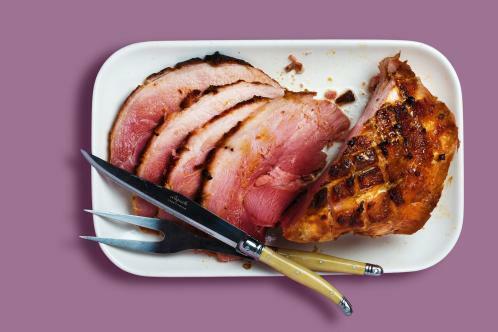 1 Place gammon snugly in saucepan, add allspice, ginger and onion. Just cover with cola, put on lid and bring to boil. 3 Cut off skin, leaving on fat. Combine mustard and sugar and smear over fat. Dot with cloves and bake at 200C/Gas 6 for 30-40 minutes, until caramelised. 1 Place gammon snugly in saucepan, add coriander, cinnamon and onion. Just cover with cider and apple juice, put on lid and bring to boil. 3 Cut off skin, leaving on fat. Combine mustard and sugar and smear over fat. Dot with cloves, pour about 1 litre of the strained cooking liquor into tray and bake at 200C/Gas 6 for 30-40 minutes. Serve with mashed potato. 1 Place gammon snugly in saucepan, add peppercorns, cloves, bay leaf and onion. Just cover with water, put on lid and bring to boil. 2 Reduce to simmer and cook for 2 hours. Drain and remove skin. 3 Melt butter in separate pan, add flour and cook for 2 minutes, stirring. Gradually add milk, stirring constantly, to make smooth sauce. Simmer for 10 minutes, stirring occasionally. 4 Season, add parsley and serve with the sliced gammon.